In reading your history"The Shelton's" by Mr. Z.F. Shelton, you will no doubt note that on page 43. reference is made to the above subject. It is also referenced on page 264 of your "History of the Shelton Family of England and America", and possibly as I did, you may ahve questions as to the truth, and the reasons for such a horrendous, and cowardly act against ones own people. This has concerned me to the point of attempting to learn the circumstances of this dastardly act against our own. I am submitting herewith some notes and a few of the facts that I have been able to accumulate to date. This is by no means the whole story, but I thought you might also be interested and that you might like to include this paper along with your historical material concerning the Sheltons. This data I have collected by actual contact with members of the Shelton family descendants who presently live in the Shelton Laurel area of Madison County North Carolina, the North Carolina State Archives, and a long time friend in the Adjutant General's Department, Department of the Army, Washington, D.C. In my contact with relatives of the victims, I found them to be as you and I, people with pride as to name and to heritage, and their beliefs as strong as yours and mine. More power to them, as they paid dearly for those beliefs and their actions. Many of our ancestors had the "wander lust" they were continually on the move westward, hoping for greater fortunes, and the usual visions that provide the incentives to reach out for better living conditions, richer lands, better crops, etc, Unfortunately they were not always able to see the fulfillment of all their hopes and dreams due to internal struggles within the country, and the resulting wars which occured all to frequently in those early days. At times they were forced to delay their marches westward to participate in, or or do whatever they were required to do in order to support what they believed to be right. In the early 1790's, just after the land was taken from the Cherokees, two brothers, David and Martin Shelton came to what is now Laurel Valley, North Carolina, from Virginia. They were there in the wilderness when the Boundary Commissioners came through in 1799. They staked their claim on "Lorrel" Creek, and it has been known as Shelton Laurel ever since. Of course these people were not burgesses, councilors, presidents, or officials of any rank, but the great majority of them were hard workers, farmers, builders of roads, of bridges, of towns, of characters, of a great nation. If they have been worthy we must emulate them and their virtues, if unworthy then we must avoid their vices. At least we must quickly acknowledge that by their hardships and self denials, their rugged and rough lives, they left to us, their descendants, paths to comforts and luxuries of which they never dreamed. Madison County North Carolina is located in the Applachian Mountains of western North Carolina where the nature of the terrain is steep, and rugged. The nature of the country is such that it would be almost impossible in which to conduct troop movements, and/or operate successfully. As a result Madison County became from the beginning of the Civil War, a haven for deserters, both Union and Confederate, bush-wackers, and Tories as the Union sympathizers in the western North Carolina area were called. As you may remember from your history the state of North Carolina did not play a leading role in the great succession drama of 1860-1861. While other states were talking seccession, North Carolinians, for the most part, still favored the National Union. Since the soil of the state was not well suited to the growing of cotton there were relatively few wealthy planters with large slave holdings to agitate for a break with the National Government. The non-slave holders from the mountain districts of the west, and the swamp regions of the east, and certain Quackers and small farm elements in the central region, could see no reason to become vitally concerned with the preservation of a slave system in which they had little part. These non-slave holding whites had considerable influence in the state and their attitude had to be reckoned with. Now back to our subject. During the early winter of 1863 brutality in the mountain struggle probably reached its height. In January of that year a band of men raided Marshall, the County Seat of Madison County, to get salt, supposedly being withheld from them due to Union sympathies. The raiders broke into several stores and took what they wanted. On hearing of the Marshall raid, Governor Vance (who was pro-union) appealed for military aid from General Hoth at Knoxville, Hoth immediately dispatched Davis' provisional force to Madison County. The report submitted by General Davis, dated 20 January 1863, stated that his men killed twelve Tories and captured twenty or more, but that the extent of disloyality had been greatly exaggerated. Subsequent communications to Governor Vance indicated that the General did not know the whole of the Shelton Laurel story. These letters told how Lt.Col. J.A. Keith, a native of Marshall and member of the 64th North Carolina Regiment had cpatured thirteen old men and young boys and had them shot under the most cold-blooded circumstances. Although the records are not clear on these points, it appears that the killings took place in February, and that periodically since late 1862, Lt.Col. Keith, with two hundred men, had been on duty in Madison County. It is said that during this period the soldiers of his command had been harassed by bush-wackers from behind every, shrub, tree, and shelter. In order to state the facts simply and as briefly as possible, it is known that Lt.Col Keith and his troops searched unrelentlessly for anyone whom they could blame for their troubles, whether guilty or not, they swept the valley of all menfolk. The evidence presented related as to how all who were unfortunate enough to be relatives of suspects that the troops could not find were whipped and tortured and hanged until almost dead and then let down for more questioning. This included an 85 year old woman who was whipped, hung and robbed, and a 70 year old lady who whipped with hickory rods until blood ran down her back. A young mother of an infant child was tied in the snow to a tree and the baby placed in the doorway of her cabin, unless she talked the soldiers told her they would leave them both there to freeze. A young mentally retarded girl was beaten and tied by the neck all day to a tree. The fifteen men who had been rounded up by the soldiers were old men too old for military service, and young boys not yet old enough for enlistment. They were told they were to be marched to Knoxville, Tennessee and turned over to the authorities there. Before dawn they were rousted from their sleep for the march to Knoxville, in the meantime two had escaped. On that fateful day the file of soldiers and their prisoners proceeded on the road to Knoxville a few miles. Then suddenly the prisoners were halted at an open area along the creek where observers could see what was to happen. Without warning or explaination five prisoners were ordered to kneel, ten paces away a file of soldiers stood, their guns ready to fire. The prisoners cried out that they should be given a chance to pray. Keith was reminded of the promiss of a trial, he ignored both. He ordered his soldiers to fire. The prisoners put their hands over their faces annd begged for mercy. The soldiers hesitated, despite what they had suffered, some refused to obey the command. "Fire or you will take their places", Keith told them. The soldiers fired, four of the prisoners died instantly, the fifth writhing in agony from a stomach wound and begging for mercy was shot in the head to end his misery. Five more were ordered to knee, among this group was 15 year old David Shelton. He pleaded with the soldiers for his life. "You have killed my father and brothers" he said "you shot my father in the face; do not shoot me in the face". The soldiers fired. The five victims fell, but once again one remained alive. It was David Shelton. He begged to be allowed to go home to his mother and sisters, but they killed him. The remaining three prisoners took their turn and died. The killing finished, the soldiers dug a shallow mass grave and dragged the bleeding bodies into it. The frozen ground, heavy snow, and the soldiers lack of concernabout the disposal of the bodies meant that the hole was not large enough to allow the earth to cover the bodies completely. Some of the bodies actually laid on top of the ground. The next day the families found their dead, and they were buried in a neat row on the hillsidenear the spot where they had been murdered. An appropiate marker has been erected at the final grave site. 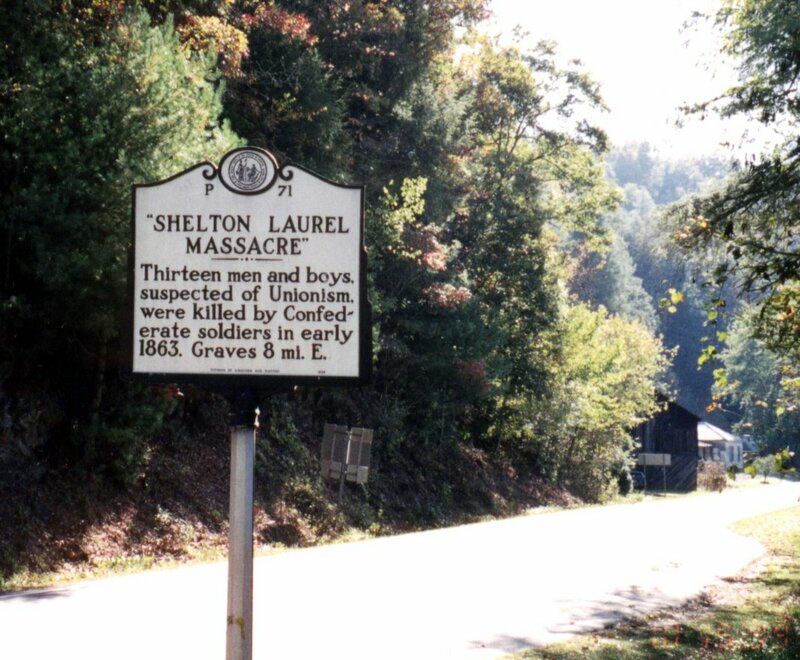 The Shelton Laurel Massacre was not become a major incident of the Civil War, although the newspapers and periodicals of that period gave many eye witness accounts of what had taken place. The act was discribed as "Humanity revolts at such a crime"; "Barberous conduct... a scene of horror"; "Cold blooded murder"; "butchery"; "Keith was a disgrase to the service and to North Carolina"; "In the name of outraged humanity demand the punishment of the officer who is guilty of these murders." The military courts took little or no action, continued delays for little or no reason, until in time the incident was forgotten at that level. Keith left the area, and is believed to have gone west, changed his name and was not heard of again. Despite all the horrible events of that day life went on in Shelton Laurel. Surviving casulities of the war were taken in by their kin who cared for them. Mary Shelton, who had been whipped and hanged for a time by the troops, lived with John and Matilda Shelton, who were pretty well off by Shelton standards and could give her the special care she needed for sometime between 1860 and 1870 she had gone insane. Martha White, who had married a Shelton was now back with her parents. James Shelton's family, which had lost the father and two sons was now headed by Patsy Shelton, who kept up the place with the help of two older sisters and their younger brothers, John and Calvin. This family stayed together, sustained by kin and love of the place. James Shelton's grandson, "Bud" is still there, and I have talked to him about this whole matter. According to the 1870 census there were seven Shelton households that were headed by women. There had only been one in 1860. There were about ten more kin living in households in which they had not been born, than had been the case in 1860. Only 4 of the 137 Sheltons listed in the 1870 census were over 40 years old. No evidence was ever presented to show or prove James Shelton, and sons, James and David, their relative, David Shelton, or William, Azariah, or Roderick Shelton, and their relatives had ever been accused of any of the so-called anti-unionist activities, participated in the raid on Marshall, or in any way harassed the troops by bushwacking, etc. As a matter of information John Shelton from that area was a Captain in the Union Army. NOTE: Col. Shelton states in a letter to me dated December 1985 that the account of this massacre itself was related to him by Rena Shelton and Mr. Berd Shelton of Marshall, North Carolina. Since then a book has been published listing him as a source of some of the facts as regard to the Shelton Laurel story.